Hillary Clinton spent 40+ minutes on the telephone with Israeli PM Binjamin Netanyahu, making it perfectly clear that, this time, the Obama Administration would not accept "No" for an answer to its demands that Israel puts an end to its provocations. 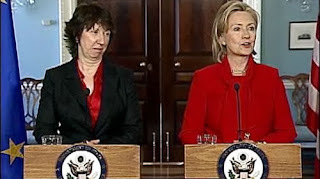 In a first show of which impact a united European stand can have on Washington's capacity to effectively change its policies in the Obama way, Catherine Ashton braved Israeli objections and visited Hamas-governed Gaza Strip on a 40+ hours' mission. Combined US and European action made the overconfident rightwing Netanyahu-Lieberman Government give in within another 40+ hours. This morning's Guardian brings a first evaluation: Israel's Binyamin Netanyahu in climbdown over US demands for peace. He [Netanyahu] did not announce, as the US had demanded, a freeze on the construction of Jewish homes in Ramat Shlomo, in East Jerusalem, the key point at issue. But diplomats in Washington, Moscow and Jerusalem said Netanyahu had given a private promise that there will be a temporary freeze on any new construction. The work, while not cancelled, is to be postponed for several years. Obama and Clinton stand to gain from the Israeli retreat, which will heighten their reputation among the Palestinians and in the Arab world. Obama and Clinton were left looking weak after a similar stand-off with Israel last September when peace talks failed to get under way. The EU as a whole is in an awkward position concerning the Middle East. They have big security interests at stake, much more important than those of the US. During the G.W.Bush administrations, a divided Europe had to remain powerless at the side-lines, when its vital interests were put in danger by the 2003 Iraq invasion, by the Bush-supported killing of the remains of the Oslo arrangements, by the ill-inspired Israeli invasion of Lebanon in 2006 and, last but not least, the Cheney-handcrafted 2008 Georgian disaster (where Israeli "advisers" to the Georgian army played a key role). Most of the time, Europe was divided. In 2002/2003, divisions between the Blair-led UK and the other bigger EU powers France and Germany, were even exacerbated, as Blair harangued most fresh Eastern European EU-members and, to a still undisclosed measure, Balkenende's Holland, at the side of the US Neocon Iraq scheme. A lasting European rift was avoided, thanks to the stupidity of US post invasion policies in Iraq, that brought soon striking evidence of the underlying fraud and made it clear, how much the Iraq adventure was and is contrary to every possible European interest. As part of the big powers' Oslo Quartet, the EU did not weigh much upon the steady dismantling of the two-state solution. As a "useful idiot", the EU furnished and still furnishes, the bulk of the international financial support to the Palestinian Authority, only to see its investments repeatedly destroyed by Israeli bombs (harbour, airport). And Tony Blair again: As a Quartet appointed facilitator of negotiations in the region, what has he done? During the 2006 Lebanon invasion, the EU found more of a common stand than before. It helped and helps, thanks to the wisdom of many Lebanese leaders, to maintain a shaky cease-fire at the Northern border of Israel. But proposals by the German Foreign Secretary Fischer, to extend the EU peace operation to areas of conflict between Israel and Palestine, fell on deaf ears. Another result of the US failures, their pro-Likud stubbornness and their open contempt of the NATO allies, has been, now and then, a revival of outdated particular claims in the Middle East from former European colonizers and mandate-holders. France saw an opportunity, for instance, after the murder of Hariri in Lebanon, to reassert some of its former influence there, as the US hopelessly failed in understanding the particular dynamics of that multicultural society. That did not help to forge a common European stand, either. But Sarkozy's unique and rapid intervention (as he happened to be president of the EU in 2008) in the Georgian conflict, showed for the first time, that the EU can deal independently with its own interests in the wider region, if it acts quick and undivided. While Cheney himself was desperately stoking conflict in defeated Tbilissi, France made for the EU an honorable compromise with Moscow that the Bush administration had to bow to. This was exceptionally possible because of the halfheartedness of the US intrigue in Georgia. For, in a general way, it is a hard fact, that the EU only can progress in its international security policy, if it is not going against the US and/or Russia's. A united stand of the EU, even at this moment of the still fledgling Ashton mission, will also influence US and Russian positions, like it seems to me, that has happened now by way of the surprising Gaza initiative of the EU's Ashton. Let us give the two-girls power a chance!